Friday. The workweek is ending, giving everyone the perfect excuse to enjoy an all night party. 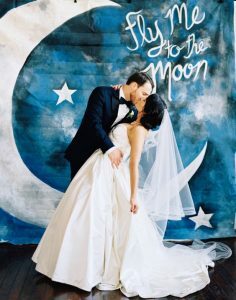 Why not take advantage of this perfect timing and get married under the stars, in a wedding where romance and joy unite? The perks of such a magical wedding abound! Let’s hit the dance floor tonight! A priori, getting married on a Friday often costs less than doing so on a Saturday; there are numerous discounts and promotions for room rentals and caterers as well as other suppliers. Other additional benefits include originality as well as an ambiance formed of equal doses of festivity and intimacy. The wedding feast can discarded. Guests arrive shortly before sundown to a profusion of canapés and welcome cocktails prior to inviting them to the outdoor ceremony under the starlit skies, for a completely romantic union… And the party begins, with dancing of course, and with friendship and fun taking precedence. Some great options are an open bar and a copious end of the night buffet to treat the guests, including a S’mores bar, a trendy 2017 delight. Let’s vanish into a décor woven of midnight blue, white and sliver. The ceiling is alight with light garlands onto which hang some round white or bluish Chinese lanterns, mirroring this unforgettable evening’s celestial dome. Surrounding the dance floor are tables awaiting guests who wish to take a break or savour the buffet service. It goes without saying that the focus must be on the lighting. 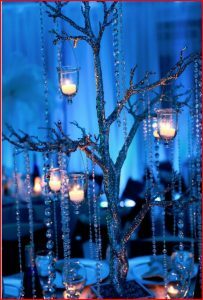 Centrepieces consist of white candles in silver chandeliers, of a multitude of lanterns in transparent containers, or of tall or round vases filled with marbles and strip lighting.